Estimated opium production in Afghanistan, an important source of funding for the Taliban, has increased 35-fold since the U.S.-led invasion, from 185 tons in 2001 to 6,400 last year, data maintained by the United Nations shows. Opium cultivation, measured by area, has also skyrocketed over the course of the war, which began on Oct. 7, 2001. According to the U.N., the total area under opium poppy cultivation reached a historic high in 2014. It increased 28-fold, from an estimated 8,000 hectares (about 31 square miles) in 2001 to an all time high of 224,000 hectares (about 865 square miles) last year. 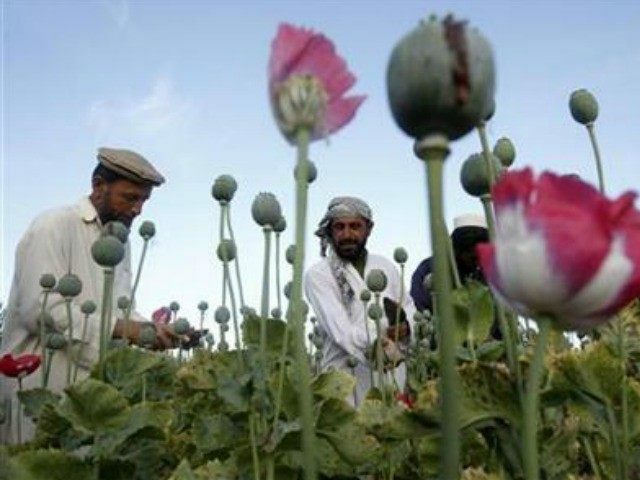 In 2014, the area under opium cultivation in Afghanistan, the world’s largest source of opium and its heroin derivative, was about 13 times the size of Washington, D.C.
Southern Afghanistan, which borders Pakistan, continued to produce the vast majority of the opium poppy plant. The U.N. also revealed that eradication decreased by 63 percent in 2014 from the previous year, to 2,692 hectares (about 10 square miles). “The drawdown of Coalition forces has affected the ability of Afghan counternarcotics forces to conduct operations…results will likely continue to decline without the support of Coalition quick-reaction forces, air support, and dedicated medical evacuation,” he continued. Opium production in Afghanistan is a major source of funding for Taliban terrorists. Recent U.N. estimates of Taliban annual earnings from the opium poppy industry ranged from as low as $100 million to as high as $700 million. The U.S./NATO-led coalition in Afghanistan estimated that the Taliban spent between $100 and $155 million of its income on mounting attacks in 2011. In other words, even if the proceeds from opium cultivation were at the lower range of $100 million in 2011, the earnings could have been enough to fund the Taliban’s ability to carry out attacks that year. With at least 404 U.S. military fatalities, 2011 was the second deadliest year of the Afghanistan war for American troops. “Opium is Afghanistan’s most valuable cash crop, and opiates—opium, morphine, and heroin—are its largest export, with an estimated value of $3 billion at border prices,” mentioned SIGAR in its October 2014 quarterly report to Congress. The estimated $3 billion value is the equivalent of about 15 percent 0f Afghanistan’s 2013 Gross Domestic Product. SIGAR reported in December 2014 that U.S. taxpayer-funded reconstruction efforts may have contributed to the booming opium trade in Afghanistan. As of the end of September 2014, the U.S. had invested $7.8 billion in counternarcotics efforts in Afghanistan, according to SIGAR. The U.S. war in Afghanistan began on October 7, 2001 in response to the terrorist attacks on the U.S. homeland nearly a month earlier, on September 11. As of the end of last year, at least 2,216 U.S. soldiers had been killed and 19,950 had been wounded in the war. President Obama ended the U.S.-led combat mission in December 2014. The estimated 9,500 American troops who remain in Afghanistan are limited to training Afghan forces and conducting narrower counterterrorism operations. “It distorts the Afghan economy, poisons its banking sector, fuels a growing illicit economy, undermines the legitimacy of the Afghan government by stoking corruption, nourishing criminal networks, and providing approximately 30 percent of the financial support to the Taliban and other insurgent groups,” said Sopko. Sopko added that opium production also places at risk the U.S.-funded $107.5 billion reconstruction effort in Afghanistan that started in October 2001. Although Afghanistan is the world’s largest source of opium and its heroin derivative, the DEA claims that only a small portion of Afghan heroin makes it into the United States. Based on heroin analyzed by the DEA, the agency’s latest National Drug Threat Assessment estimates that in 2012, the Afghanistan region was the source of only four percent (by weight) of the heroin in the U.S.
Heroin from Mexico (45 percent) and South America (51 percent) accounted for the rest. Nevertheless, the Mexican Newspaper El Universal has reported that Mexican cartels are buying heroin from Afghan drug dealers. Heroin trafficking by Mexican cartels across the southwest border is increasing along with heroin overdose deaths across the United States, the latest DEA drug threat assessment shows. Estimated opium production decreased from 3,276 tons in 2000 to 185 tons the following year, marking a decrease of over 94 percent. The dramatic drop was attributed to Afghanistan’s 2000 drug eradication program under the Taliban. Potential opium production increased back up to 3,400 tons in 2002 under the U.S.-backed government of Afghan President Hamid Karzai and has been rising since . Estimated opium production in Afghanistan peaked at 7,400 tons in 2007.